Southampton SETsquared member, Nquiringminds, has been featured as a case study in the Government’s Industrial Strategy. The case study on Nquiringminds is to underline the Government’s commitment to fostering SME growth in innovation. In the report, Nquiringminds is highlighted as a successful example of how Small Business Research Initiative (SBRI) support has led to a successful collaboration in the public sector. 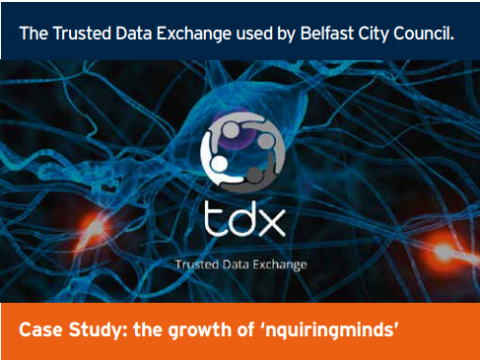 The case study sites work undertaken with Belfast City Council, where Nquiringminds introduced the Trusted Data Exchange (TDX). TDX provides analytics and secure data-sharing, powered by artificial intelligence, that allows users to share data sets, maximising the ability to analyse and generate insight. Belfast City Council used the TDX with internal and open data sets to optimise the collection of business rates. The Trusted Data Exchange is a cloud based secure data platform, designed with the connected economy in mind. It allows sharing of data, data analytics processes and visualisations with security of data at it’s core. SETsquared has supported Nquiringminds since it started in the Southampton SETsquared offices in 2010. The company has now grown from its two founders to employing 1O staff, with clients from across the public and private sector.